This has become a new favorite dish of mine. Immediately after I ate it the first time, I added it to the menu again the following week and have eaten it countless times since. I can throw this dish together so fast that it is perfect for a weeknight. It is so creamy and delicious and I feel like I'm being healthy when I eat it. Last time, I used low-fat Cheddar cheese and it was just as good. That was my first time ever using a low-fat Cheddar and I thought it tasted the same as regular and it melted just as well. 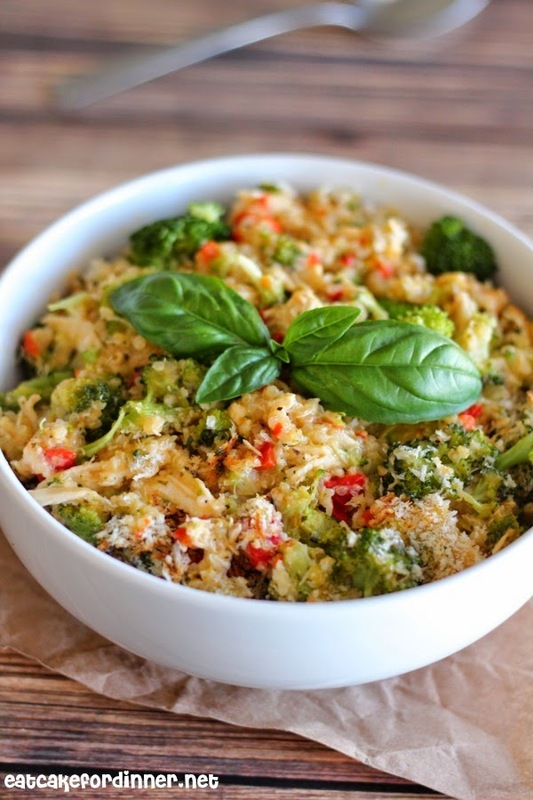 Instead of making the same old Chicken, Broccoli and Rice Casserole next time, do yourself a favor and make this instead. 1 roasted red pepper, chopped, opt. Cook quinoa according to package directions. In a large, oven-safe skillet, over medium heat, melt the butter; add the red pepper and saute for two minutes. Whisk in the flour until a thick paste forms. Gradually whisk in the milk. Add chicken bouillon powder, Italian seasoning, onion powder and pepper. Continue cooking until thickened and creamy. Stir in the Greek yogurt and grated cheese. 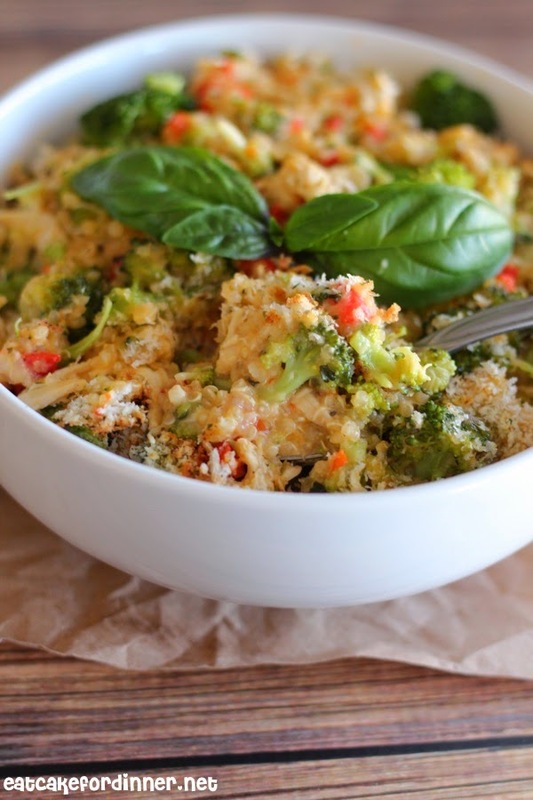 Add the cooked quinoa, cooked chicken and steamed broccoli and stir together until everything is evenly coated in creamy sauce. Sprinkle Panko bread crumbs, parsley and Johnny's garlic seasoning over the top and spray with butter spray. Place in the oven and broil for a few minutes to toast the bread crumbs. Serves: 2-3. 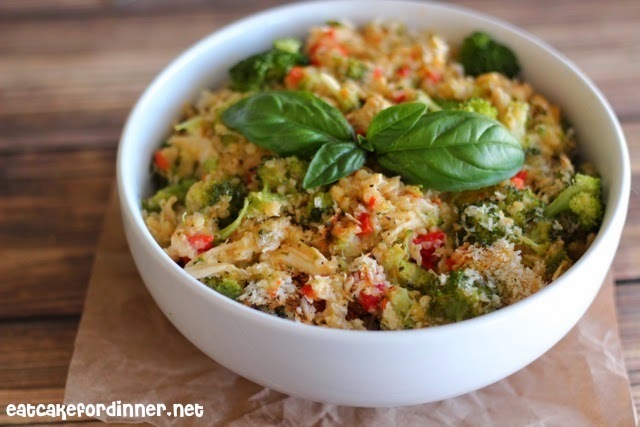 Love this lightened up casserole! I need more quick recipes like this!